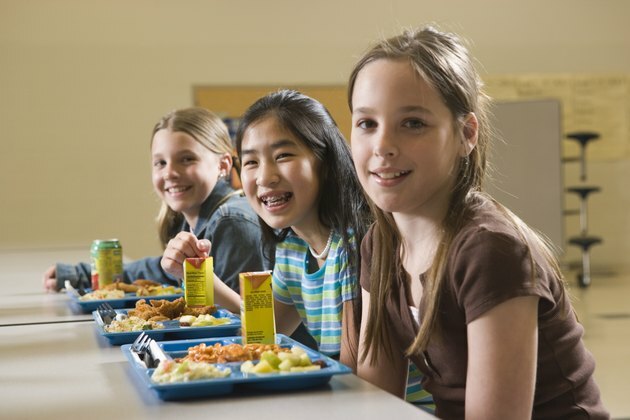 The federal government has a variety of rules and regulations that apply to school lunches. These mandates are designed to make sure that healthy lunches are available in school, but in reality, what ends up on a child’s plate isn’t always nutritious. A junk meal or two won’t have a permanent impact on a child, but eating unhealthy lunches for years can take a seriously negative toll on both mental and physical health. In early 2012, the U.S. government updated the National School Lunch and School Breakfast Programs. Changes included counting fruits and vegetables as separate meal groups, offering fruit every day, making half of grain choices whole grains, giving different grades different meal sizes and reducing sodium and trans fat in meals. However, not all schools implement the NSLP and not all students eat the healthier choices schools do provide. One major risk of unhealthy school lunches is a contribution to obesity and other weight problems in children across the nation. According to the Weight-Control Information Network, about a third of kids and adolescents in the United States are overweight or obese. Even if the government regulates the number of calories a child’s school lunch has, as it does with the NSLP, many schools allow children to purchase a la carte foods on top of the lunch that are calorie-rich and high in fat, sodium, sugar or all three. Effects of poor nutrition from school lunches go beyond weight gain. A child who eats too much fat, sugar, sodium or processed food and too few vitamins and minerals is likely to develop a higher risk over time for several chronic health problems. These might include diabetes, kidney stones, bone loss, cancer and heart disease. Active kids who need more calories than the federal limits are also at risk, and may end up feeling weak, fatigued or nauseous during sports and exercise. Proper nutrition is also tied to better academic performance, so kids who eat unhealthy lunches are more likely to score lower on tests and have a harder time with schoolwork. There are long-term effects as well. According to a 2012 article written by registered dietitian Timi Gustafson, not getting enough essential nutrients at meals may lower kids’ IQ scores, memory capacities, fine motor skills, social skills and languages skills into early adulthood and beyond. A child’s poor dietary habits can even influence his sleep patterns, which may have an effect on cognitive behaviors and academic abilities. According to the results of a research review published in 2004 in the "British Journal of Nutrition," children who are micronutrient-deficient may exhibit more aggressiveness, less mental endurance and lower intelligence test scores.